Rain, rain go away, see how much damage you caused – and on Christmas Eve? Couldn't you come another day? 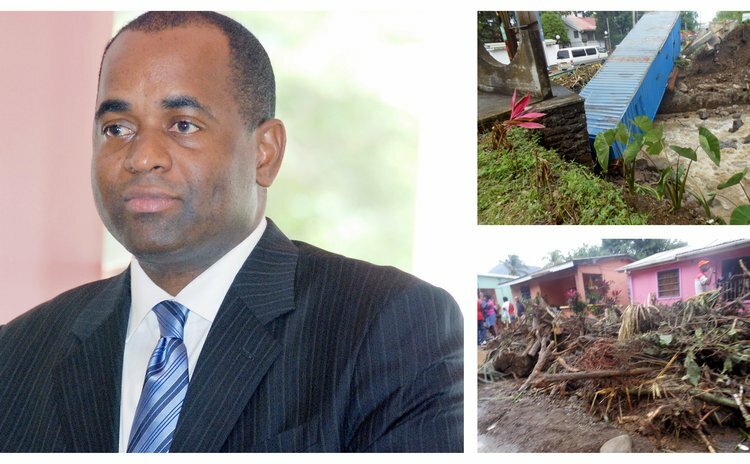 According to Prime Minister Roosevelt Skerrit, the heavy rains which soaked Dominica, St. Lucia and St. Vincent and the Grenadines two days ago caused much damage to homes and infrastructure in Pointe Michel, Loubiere, Fortune, the Roseau Valley and New Town. The Public Works Department estimated that it will cost EC$45 million to build retaining walls, bridges, homes, and repair roads and culverts in the area. And the clean-up operation alone will cost about $870,000, Skerrit told DBS radio this evening. But Skerrit said his government at a meeting today decided to assist families affected by the rains. He said Cabinet decided to provide "100% of the total assessed amount for the repair of the homes"; 60% of the cost of personal effects and "the government will provide free text books, stationery and other school supplies to all students affected." Additionally, the government will pay rent for persons who have to be moved from their homes to new homes. "Those who have to be relocated temporarily, rent will be paid for a limited amount of time," Skerrit said. " That also includes persons who own homes but their homes were severely flooded and the will have to vacate for some period of time." But where will the money come from? Prime Minister Skerrit was not clear about that; he stating that he has received calls from the Caribbean Development Bank, the European Union and the World Bank about the extent of damage but all countries are stretched financially. "There are three countries in the OECS affected and all of us have the same development partners, the same friendly governments. We all have to admit that it is going to be challenging," he said. "It's not that we have a lot of money but we feel a certain amount of responsibility to assist these people who have been affected". To hold today's Cabinet meeting Skerrit cut short a visit to the United States and on his return to Dominica he visited the flood-hit area with his ministers. Based on his assessment, the Prime Minister concluded that much of the disaster could have been avoided. "We as citizens must be mindful of our own practices insofar as the environment is concerned," Skerrit said. "For instance what we found out from residence in the Castle Comfort area who were heavily affected, was that there was a land-owner higher up who felled some trees and threw the trees in the river. That was part of the contributing factors for the damage to several homes, to the Anchorage Hotel, Evergreen Hotel and to a certain extent Castle Comfort Lodges". Skerrit said citizens have to be educated about disaster risk management.